What an exciting and invigorating weekend! Five of us from our writers group attended the Oxford Creative Nonfiction Conference at Ole Miss in Oxford: Kathy Rhodes (who was “staff” and worked very hard! ), Mary Buckner, Doug Jones, Rick Romfh. We’ll have many stories from the weekend. Fun, entertaining, instructional, motivating – it was an unforgettable experience. Being with our group made it just that much better, and we made some new good friends, too. Writers are the best! This entry was posted in Arts Community. Bookmark the permalink. My day job is teaching English. Since 2002 I have served on the English faculty at Nashville State Community College, where I have taught courses in composition, literature, and creative writing. I am editor of the literary magazine, Tetrahedra. I earned my B.S. in Education at the University of Tennessee, Knoxville, and received my M.A. in English from Austin Peay State University, Clarksville, Tennessee, where the graduate program offered both creative thesis and scholarly thesis options. I submitted a creative thesis, a 90-page collection of stories entitled Listen to Me. Most of the stories have been published in literary journals and/or have received awards. My writing career spans three decades. My history of publication includes both fiction and nonfiction. I have published two novels and more than thirty stories and articles in literary journals, anthologies, and magazines. It was an honor for me when one of my stories appeared in HomeWorks in 1996. The anthology was a collection of works by Tennessee writers living at that time, including Alex Haley, Robert Penn Warren, and Peter Taylor. The highlight of my writing career occurred when I received the Tennessee Arts Commission’s Individual Artist Award in Fiction for 2006. Other writing achievements include the Leslie Garrett Fiction Prize awarded by the Knoxville Writers Guild, Tennessee Writers Alliance Short Story First Place Award, and the North Carolina Writers’ Workshop First Place Award in Creative Nonfiction. In 2005, I received a Pushcart nomination for my story, “Primates,” which was published in Bellevue Literary Review. My most recent award came from the Knoxville Writers’ Guild, the 2008 Creative Nonfiction First Place Award for my essay, “In the Car with Mother on Christmas Eve.” I am a founding member of the Tennessee Writers Alliance and served on its Board of Directors for ten years, including two terms as president and one as chair of the Board. Gobbell’s writing career spans three decades. 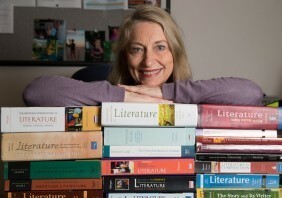 Her history of publication includes both fiction and nonfiction. She has published two novels and more than thirty stories and articles in literary journals, anthologies, and magazines. One of her stories appeared in the anthology, HomeWorks, in 1996, a collection of writings by Tennessee writers living at that time, including Alex Haley, Robert Penn Warren, and Peter Taylor. She is a writer of fiction, nonfiction, and poetry. Two true-crime books, An Unfinished Canvas (Berkley, 2007) and A Season of Darkness (Berkley, 2010) are accounts of high-profile, cold-case murders in Nashville. She is now writing the Jordan Mayfair Mystery Series: Pursuit in Provence (Five Star, 2015) and Secrets and Shamrocks (Five Star, 2016). Treachery in Tuscany (Encircle) was released in Spring 2018. Gobbell received the Tennessee Arts Commission’s Individual Artist Award in Fiction for 2006. Other writing achievements include the Leslie Garrett Fiction Prize awarded by the Knoxville Writers Guild, Tennessee Writers Alliance Short Story First Place Award, and the North Carolina Writers’ Workshop First Place Award in Creative Nonfiction. In 2005, she received a Pushcart nomination for her story, “Primates,” which was published in Bellevue Literary Review. She won the 2008 Creative Nonfiction First Place Award from the Knoxville Writers’ Guild for her essay, “In the Car with Mother on Christmas Eve.” Twice she has received the Leslie Garrett Award for Fiction, most recently in 2014. An active participant in the writing community, Gobbell helped to organize the Tennessee Writers Alliance in 1990 and served on its Board of Directors for ten years, including two terms as president and one as chair of the Board. She was also a founding member of the writers group that still meets every Tuesday night, the Nashville Writers Alliance. Since 2002 Phyllis Gobbell has also served on the English faculty at Nashville State Community College, where she is now Associate Professor. She teaches courses in composition, creative writing, and literature. She served as editor of the literary magazine, Tetrahedra, for eight years. She earned her B.S. in Education at the University of Tennessee, Knoxville, and received her M.A. in English from Austin Peay State University, Clarksville, Tennessee, where the graduate program offered a creative thesis option. Her thesis was a 90-page collection of stories entitled Listen to Me. Most of the stories have been published in literary journals and have received awards.